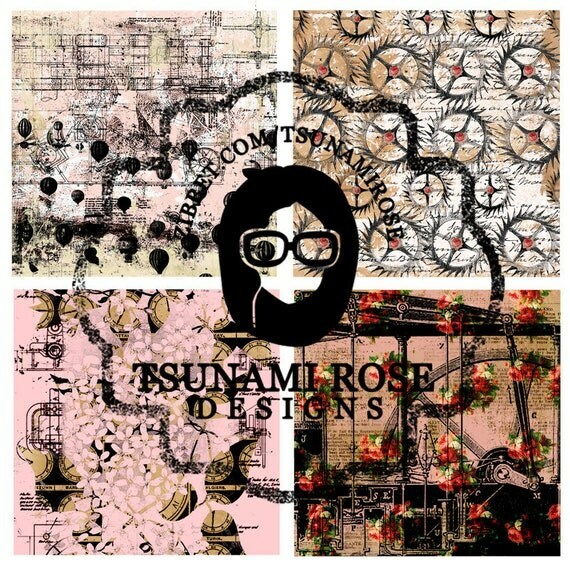 So I am excited to announce that I am on the Tsunami Rose Design Team. Actually for a second time. But it's been a few years since the last time. 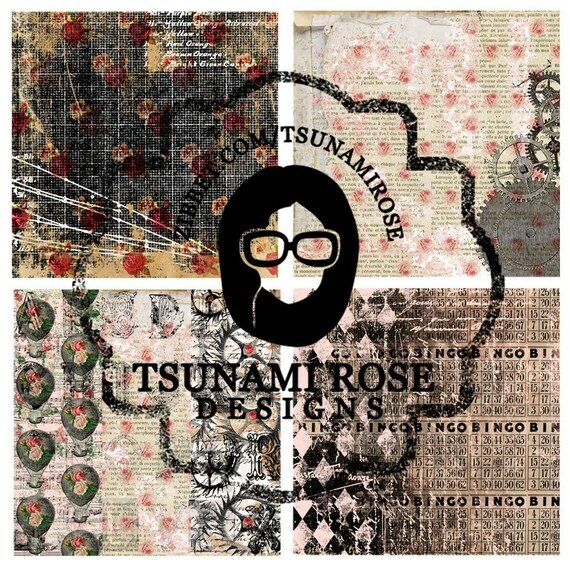 I Just love the papers made by Daisy Collins, Owner & Creator of Tsunami Rose Designs. She makes digital printable paper, kits and more. 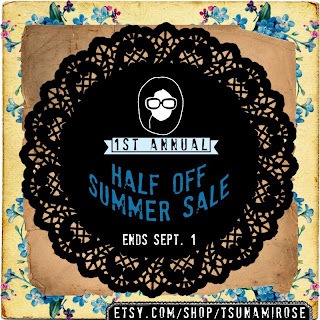 You can find her work on Etsy and on her Blog. Her work is AMAZING, you will not be disappointed. 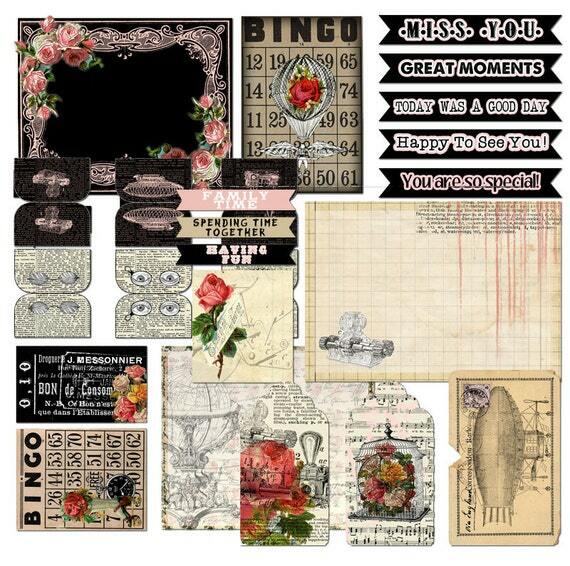 I am using one of her new Printable Journal Kits that comes in a 6" x 6" format on my 1st Design team project. And she has a 1/2 price sale going on right now. So you can get the kit for only $2.50 till 9/1/15. Is that crazy or what. 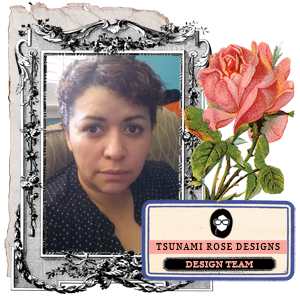 Look at the pretty Design Team Badge I got. Love it. So here is my first project. My assignment was to alter an object. 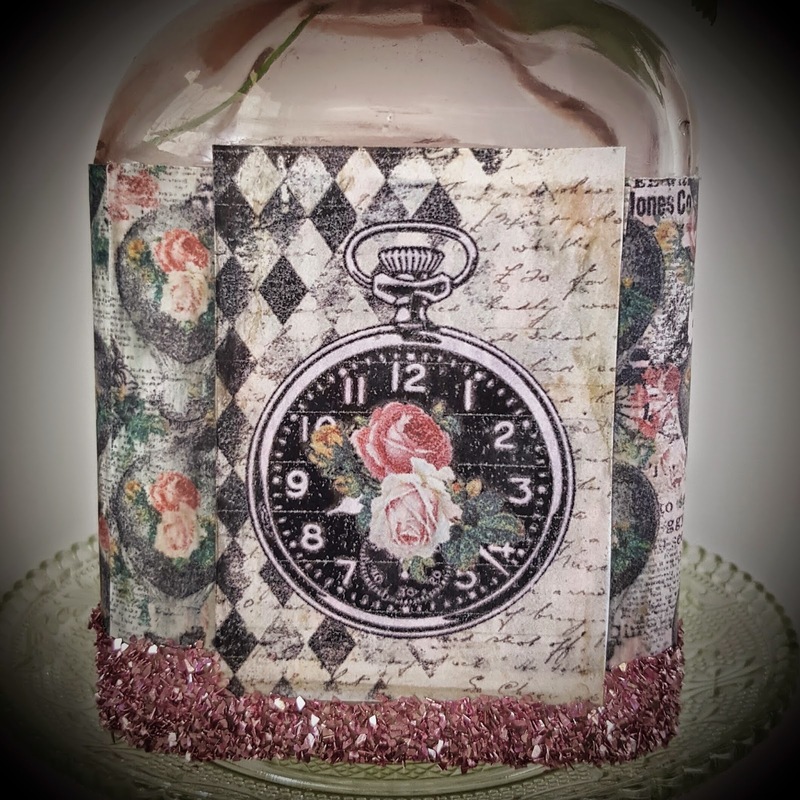 So I choose this pretty little bottle I pick up at Michaels for just a few dollars. 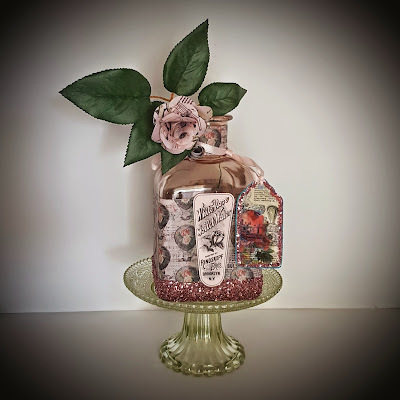 I just loved working with this paper design. I printed out all of the papers using Vellum except the White Rose Label and the Tag. I wanted the bottle to still have a translucent look when light shined through. All the colors still came out so vibrant I was in love with them. 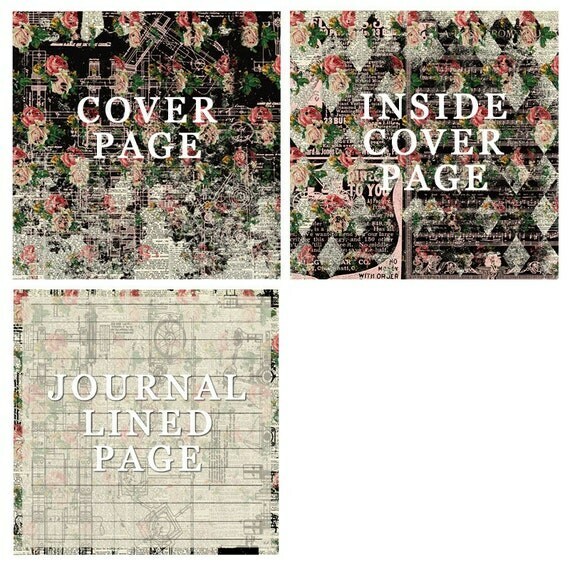 I wanted to print out all of them on Vellum, which I may still do for my next project. Check out the kit I used below. Then keep scrolling for close ups of my project and details on how I created it. 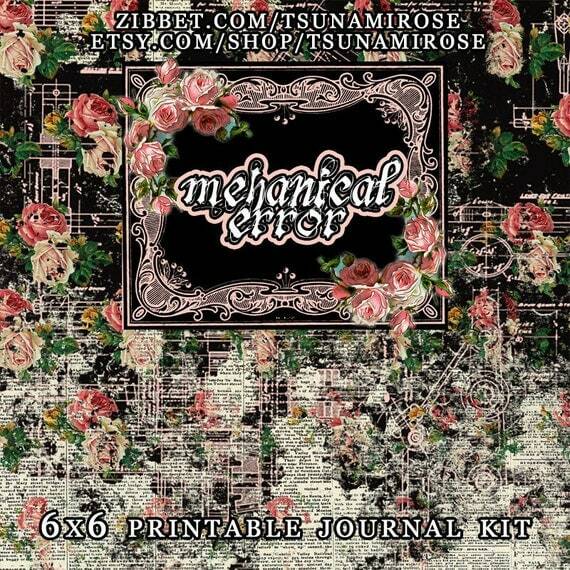 The Kit I used is called Mechanical Error. I just Adore it. You get all this in the Kit. Each page is formatted to print on a letter size paper. And packed nicely to not waste any paper. 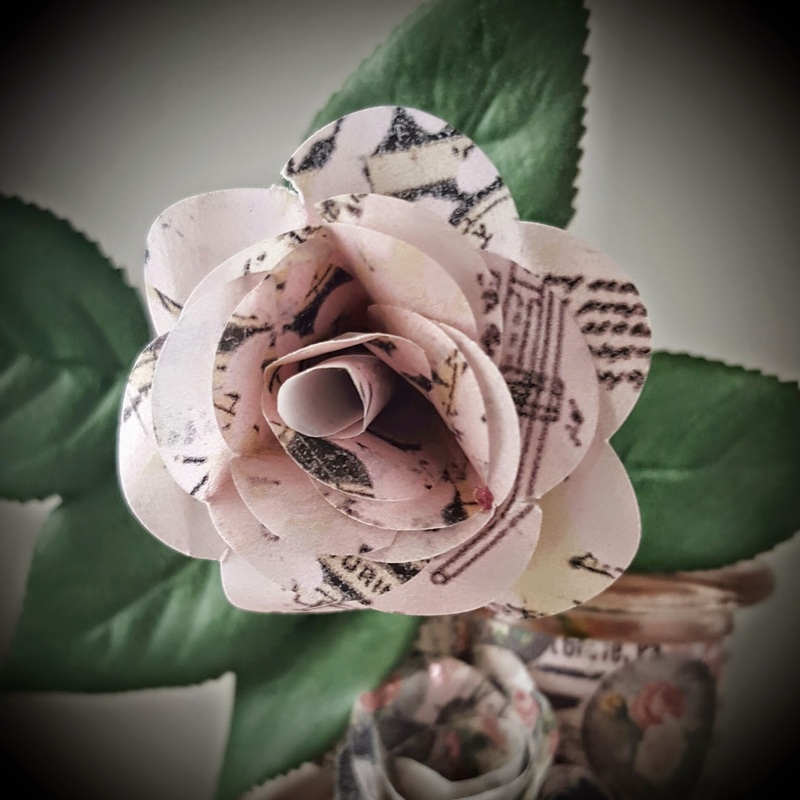 I handmade this rose using the printable kit on vellum and a heart shaped punch. I love the look it created. I did learn that I have to be a little careful about bending the vellum as it made a little tear. The leaves are from a silk rose my mom had. Sorry mom but thanks. 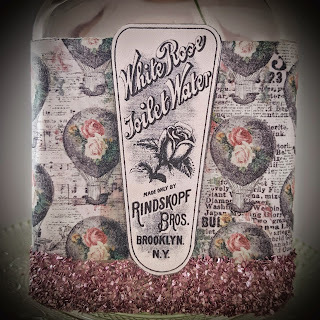 The front of the bottle shows off a pretty little vintage looking Toilet Water label. That was printed on plain white Recollections card-stock. 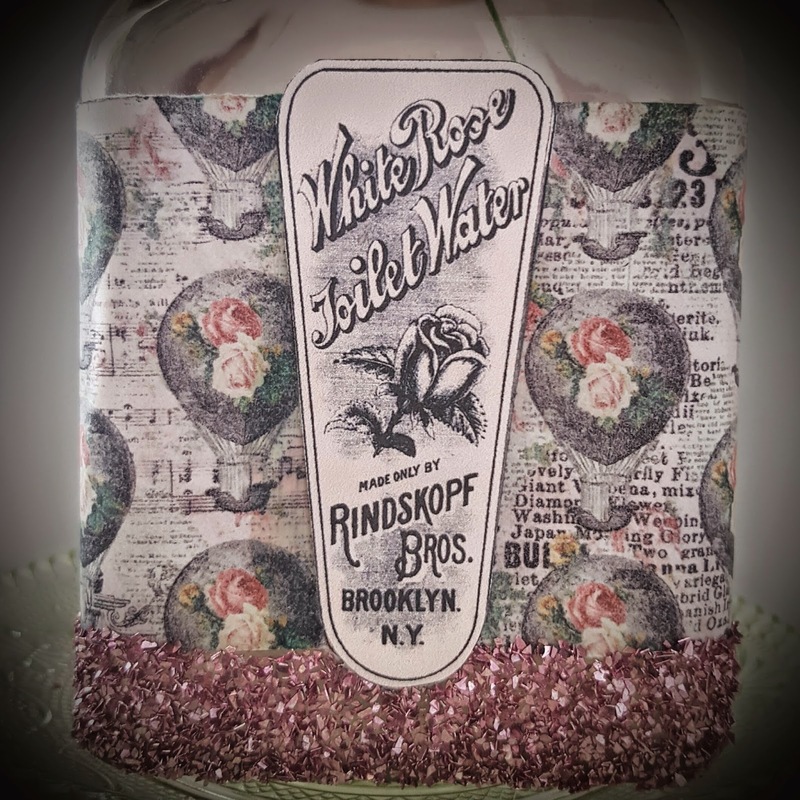 The paper that wraps the bottle was printed on vellum. I love the Hot Air Balloons. 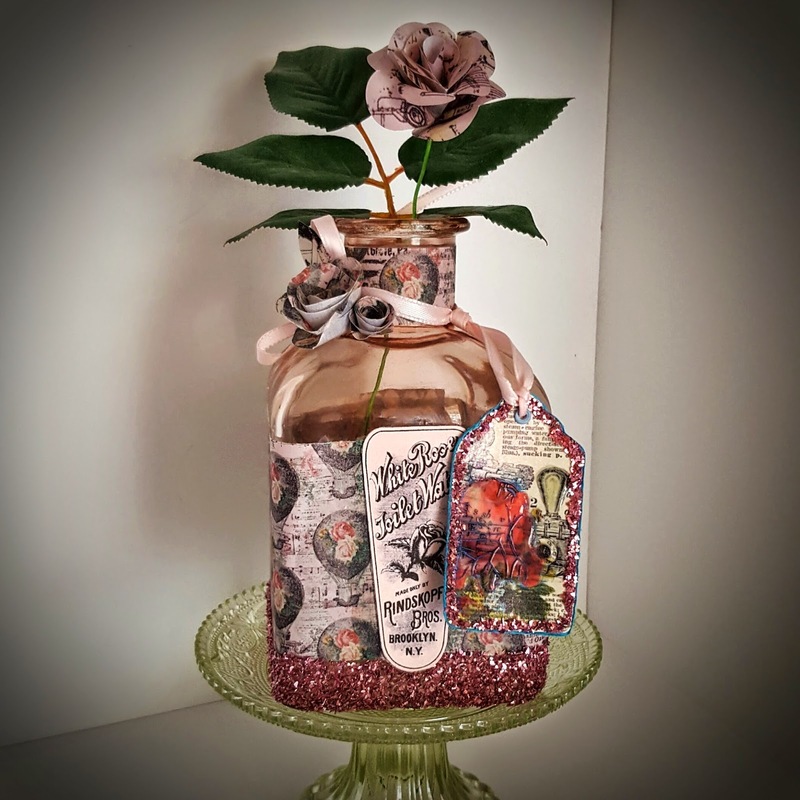 I added chunky real glass Recollections Glitter to the bottom. I used Heavy Liquitex Gel Medium to attach the glitter. And Matte Gel Medium to attach the papers. On one side only. I did notice that the vellum smears easily if you don't let it dry for a couple days. 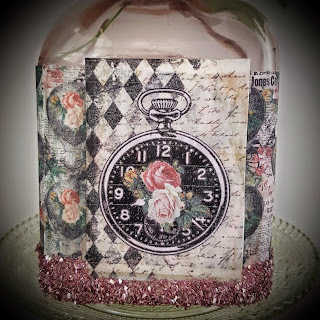 Here is the back of the bottle where I place this ATC sized Pocket Watch Print. Love the Harlequin Pattern. I made these two little rolled flowers again with vellum and used Beacon 3 in 1 Glue to secure them. I added the Chunky glass glitter to one center and a blue pearl bling to the other. 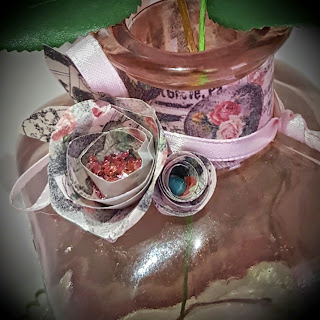 I hand cut some simple leaves to put behind them and added a tag with a simple pink ribbon to fasten just behind the flower on purpose to act as a second set of leaves. 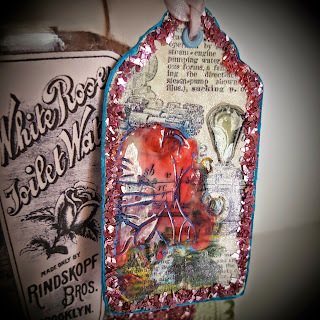 The neck of the bottle was also printed on Vellum and centered just so the balloon showed. The tage was printed on white cardstock and backed with a pretty blue scrap paper. 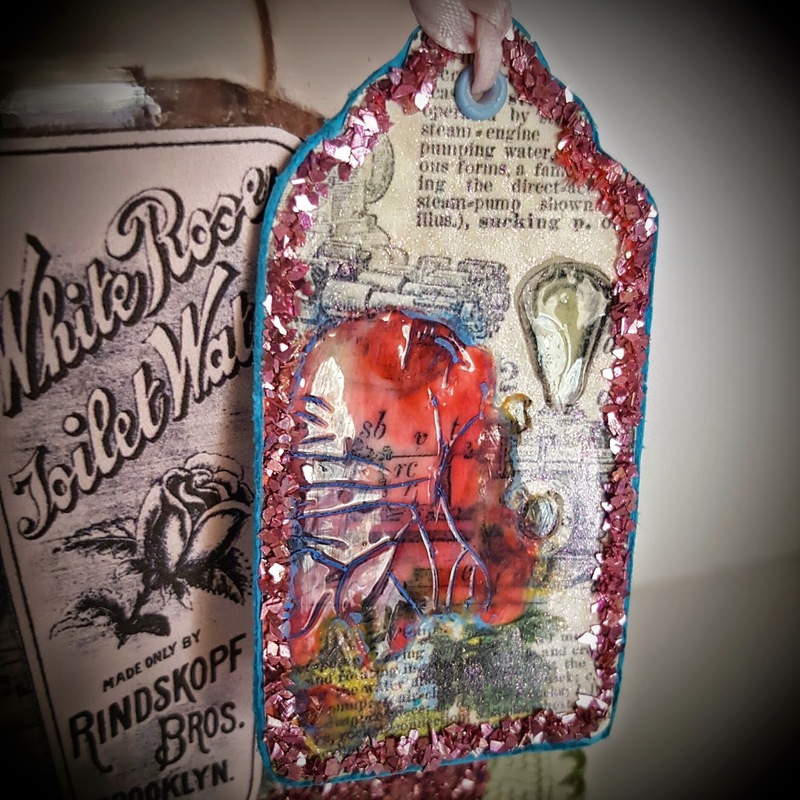 The tag was embellished with Recollections Glass Glitter, Ranger's Glossy Accents on the light bulb and Ranger's Crackle Accents on the rose. I added blue Neon Craft Smart paint to the cracks and some edges. Popped a hole at the top of the tag using my Crop A Dile from We R Memory Keepers and attached a blue eyelet and strung the pink ribbon through. And once again the Finished Project. Which will now be given to my mother. Oh the green base was a little cake pedestal found at Michaels for only 1.25.